Why’s it hot? Heralded by a grand opening party last week headlined by Leona Lewis, the 72-storey JW Marriott Marquis Hotel Dubai rises to 1,164ft, making it the tallest all-hotel building in the world. That’s just over 100ft higher than the Eiffel Tower, and not surprisingly it’s become the most desirable place to stay in this booming desert city. What’s it got? Two towers with a design inspired by the jagged trunk of a date palm tree. Only one is currently open with the second to follow next year − when completed this five-star hotel will boast a whopping 1,608 rooms and suites. As well as offering supremely comfortable rooms backed up with top-notch service, this is a perfect place to get a taste of the amazing things now happening in Dubai. 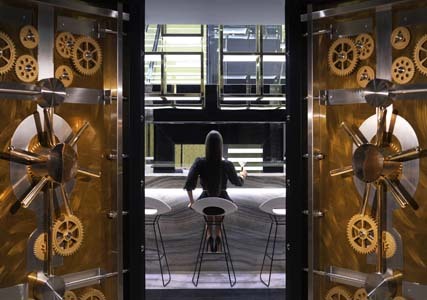 Even if you don’t stay, the JW Marriott Marquis is worth visiting for a drink (in the UAE you can generally only buy alcohol in hotels), or have a meal in its signature restaurants which include Thai, Japanese and Indian cuisines. For the last, Rang Mahal serves fish and lamb dishes from another realm and is overseen by Atul Kochhar, the Michelin-starred Indian chef at Benares restaurant in London. If you want a spectacular view as well, head for the melt-in-the-mouth fillet steaks (from £31) served in the elegant 68th floor dining room Prime 68. Or just sip a X Marks the Spot cocktail (£12) in Vault, which is set on the 71st and 72nd floors and has a cigar lounge. Booking and smart dress essential. Wow factor: It’s not just about height − the JW Marriott Marquis is a cool place to go and acts such as Snoop Dogg and The Stone Roses have stayed here when playing gigs in the emirate. 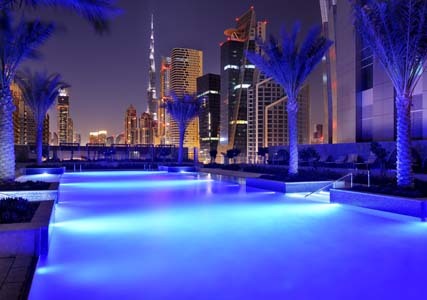 One of the hotel’s best features is the heated outdoor pool, which catches the sunset and offers the chance to swim lengths while admiring the views of the world’s tallest building, Burj Khalifa. 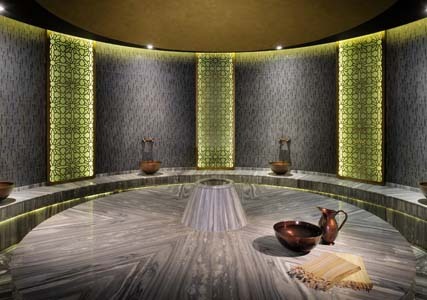 There’s also the enormous and very professional Saray Spa which has treatments inspired by Arabia and the Far East, including a rejuvenating Milk and Honey Immersion (£156) for that ultimate Cleopatra moment. Ask for a deluxe room as high as possible − mornings in Dubai can be foggy, which means you can wake up above the clouds with an extraordinary view of the city’s skyscrapers poking through. Those ending with the number 1-7 face the sea, while 8-14 look to the city. The style is subdued, contemporary luxury using wood, stone and sumptuous fabrics in restful neutral tones. Lights, curtains and air conditioning are controlled using a nifty touch-screen tablet. The pricier executive rooms, which tend to be on the higher floors, include free Internet access and use of an exclusive 37th floor lounge with complimentary food and drinks. Need to know: The JW Marriott Marquis is part of the still-evolving Business Bay district. As with much of Dubai, there is little sense of neighbourhood − just skyscraping office blocks, ongoing roadworks and more construction sites. You’ll need to take a taxi to do anything but they are inexpensive and you can get to most places within 20-30 minutes. Alternatively, a ten minute walk will get you to Dubai’s sleek, cheap and air-conditioned overhead metro system (dubaimetro.eu). Bear in mind that here the weekend starts on Thursday nights with everyone returning to work on Sunday. It’s best to book restaurants and tables in bars in advance. For sea breezes and a fine view back to the shore, take a taxi to the One&Only The Palm resort (oneandonlyresorts.com), set on a man-made, palm-tree-shaped island. Here the al fresco 101 lounge bar is a good spot for a sundowner and some tapas, and you can then take a free boat back to its sister hotel, the One&Only Royal Mirage. Don’t expect lots of shopping bargains − most branded goods are cheaper back home, but this is a popular place to buy gold, diamonds and jewellery, either in the souks or at the Gold & Diamond Park (goldanddiamondpark.com). The Mall of the Emirates (malloftheemirates.com), with its indoor ski slope complete with waddling penguins, is worth seeing and you can also whizz up to the 124th floor of Burj Khalifa (atthetop.ae). Book now: Emirates (emirates.com) flies to Dubai from six UK airports, from £480 return including taxes. Double rooms at JW Marriott Marquis Hotel Dubai (jwmarriottmarquisdubai.com) cost from £258. Dubai & Abu Dhabi (£14.99, Lonely Planet) is a handy guide, for more information see definitelydubai.com.